In January 1951, Junius Kellogg, the first African American basketball scholarship recipient at Manhattan College, was approached by an ex-player fronting for the mob, to fix a basketball game. The NCAA suspected that games were being fixed but they could find no one brave enough to come forward. Junius reported the incident to his coach and it set off a chain reaction where at least 7 colleges, 35 players and mobsters and 89 games were affected by gambling. 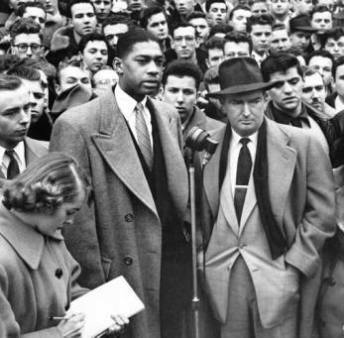 Junius became a role model for good ethics but after graduation he could not even get a look from the racist NBA. 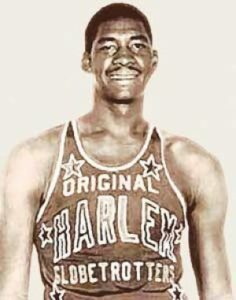 He instead went to the Harlem Globetrotters tryouts and beat out 40 other players to make the squad. While en route to a 'Trotters game, this magnificent 6'10" player was involved in a horrific automobile accident that left him paralyzed for life. Indeed, no one at the scene was convinced he would live. 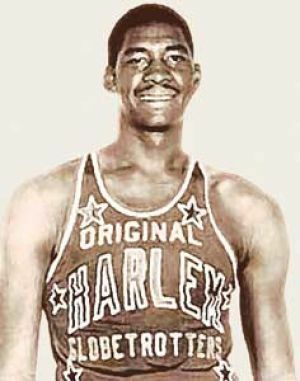 Yet what Junius did from his wheelchair, from being the first African American coach in the history of wheelchair basketball to working under five New York City mayors as Director of Strategic Planning for the city's Community Development Agency, is the stuff of legend. For 48 years, one friend stood by Junius - and it was a most unlikely friendship, for Bob Otten was raised by racists and anti-Semites. The lives of Bob Otten and Junius Kellogg intertwine throughout the story. Bob witnessed Junius receive an honorary Ph.D., accepted into three Halls of Fame and live a full and successful life. The relationship between Bob and "Junie" was reciprocal. Junius helped Bob pull through some his worst hours. The story is intensively researched, important for our troubled times, and true. 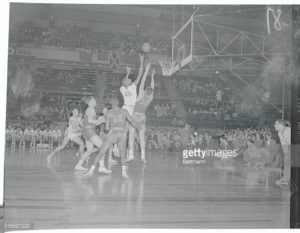 "Junius Playing in Madison Square Garden - c. 1952"